Winnebago Industries is known around the world for its luxurious Class A motorhomes. 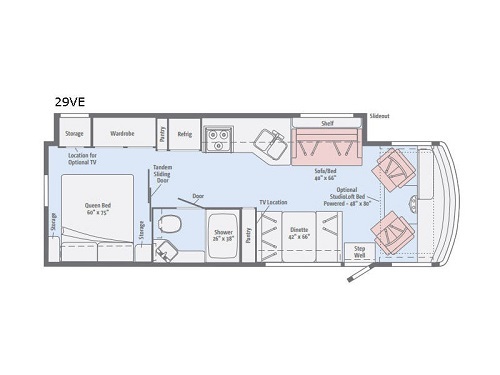 Quality construction, luxurious features, functionality, and space define the 2019 Winnebago Sunstar, so you enjoy a Class A experience that’s superior to others in the industry. It’s hard not to fall in love with the interior of the Sunstar the moment you step inside. Residential touches like a gourmet kitchen, raised-panel cabinetry, solid-surface countertops, nickel hardware, flat screen TVs, LED lighting, and more make your new RV feel more like a brick-and-mortar home than an RV. The 2019 Sunstar encourages you to enjoy your time outside of your RV at the campsite. Numerous exterior graphic designs, black-framed baggage doors, a 30-amp power cord, patio light, exterior speakers, 4-inch extended rain gutters, stabilizer jacks, a power awning with LED lighting and countless other standard features and options help you fine-tune your outdoor experience to perfection. The only way to truly understand the luxury and convenience of the 2019 Winnebago Sunstar is to see it for yourself. 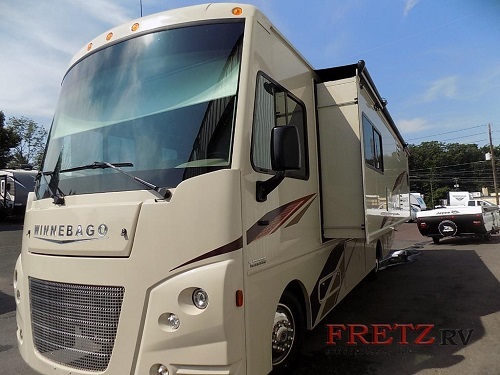 Come check it out right here on our lot at Fretz RV in Souderton, Pa. Give us a call, visit our website, or stop in to tour this luxurious Class A today.